If Chandler gets bored in quiet time, he'll sometimes lay down and sleep. This happened today and he wandered out pretty dazed before quiet time was over. I'd planned to lay down for a nap too, but got carried away with what I was working on. So I suggested we snuggle together. We laid on the guest bed and he actually relaxed. This never happens. No wiggles. No whispered, "Mommy! Mommy!" followed by suggestions of what would be more fun. He even closed his eyes. When I woke up, sure enough, he'd fallen asleep. My hand rested on his chest and under it, I could feel a very precious thump-thumping. 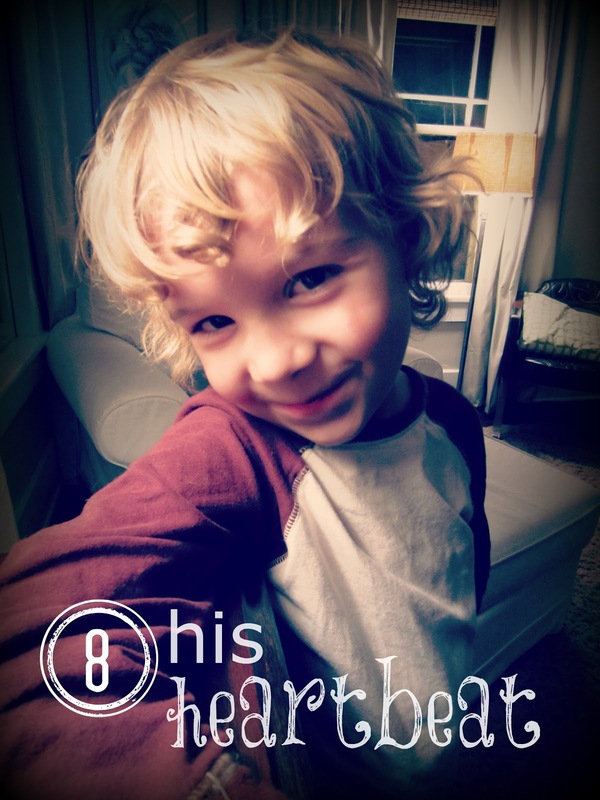 I wondered that his little heart is working away, around the clock, to keep my boy alive. It was reassuring to feel it, like the whoosh-whoosh during his ultrasounds years ago. I'm deeply thankful for every marvelous day that his heart beats. What a charming little face he has. Why, he could charm a grandma out of a whole batch of cookies every time!